Simon got a pedicure and his shoes reset last night. I keep shoes on all four of his hooves, mainly because I like to trail ride and the trails around here are very rocky and often require riding on gravel fire roads. We also ride heavily in the summer when the ground is dry and shoes prevent his hooves from cracking or chipping. I have borium shoes on him. Although rare for US mounted games ponies to be in special shoes, or often, shoes at all, I primarily use these shoes on Simon because of mounted games. Last summer he was sliding out on his turns and on the dry grass trying to make quick stops and he was uncomfortable with that and began to slow down and be more cautious. I was also uncomfortable with that and decided to look into shoeing options. I contemplated getting drilled shoes so I could use studs when I rode but when I honestly thought about it, I just couldn’t see myself taking the studs in and out all the time. I talked to my ferrier about it and she suggested we try borium. 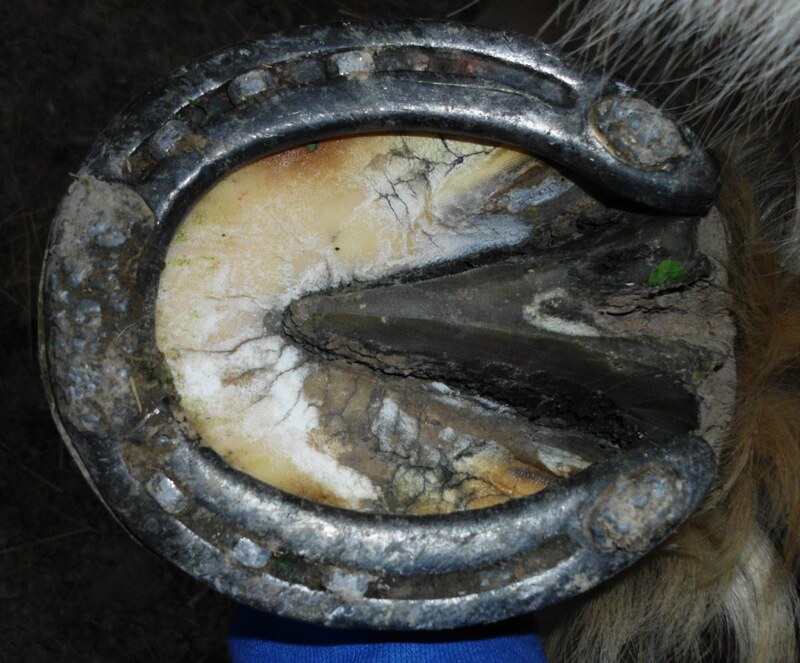 These type of shoes are often made special for driving horses and are sometimes called “road shoes”. Horses that go on frequent road hacks, foxhunt, or ride on a lot of trails with unfavorable terrain may also use borium shoes. Simon was a driving pony before I got him and he came to me in borium shoes. And he was much happier once the borium shoes were back on and he got the added grip he needed. Borium shoes can be a bit controversial. A lot of riders choose drilled shoes with studs instead. This way the rider can take the studs out when the horse does not need them. But with Simon’s shoes, a lump of borium is applied to the toe and both sides of the heel and is fixed there. So he has his grip on all the time. One of the draw backs is if a horse in borium shoes kicks another horse, the damage from the kick can be greater than with a flat shoe. Simon is not a kicker, and is more often than not, in his own pasture. So this was not a concern for me. Another factor to consider when choosing this type of shoe, is that it does grip all of the time. 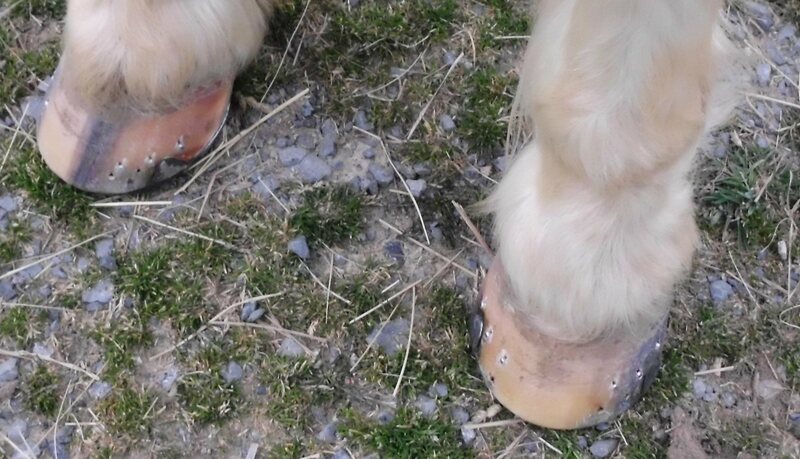 Where normal shoes, or a barefoot hoof is able to slide a little, Simon’s hooves will now grab all of the time. Sometimes this can cause a little bruising or soreness in some horses and it tends to be a tad more jarring for them. Some people feel a horse’s hooves should be allowed to “rest” for part of the year with no shoes at all. Generally for 3 trimmings or more. This also works for some horse owners that take the winter off from riding or ride very lightly. They can pull the shoes and let their mounts and their mount’s hooves, have a rest. But, like with almost everything having to do with horses, there are many schools of thought, and everyone has their own opinion. For Simon and I personally, I choose to keep the shoes on. He is noticeably more confident and comfortable when he has them on, and since we ride in varying terrain year round, they do get a lot of use. You may notice black marks near the metal clips on his shoes. This is becuase I use a hot shoer. My ferrier heats the shoe up and then applies it to a trimmed and prepared hoof. 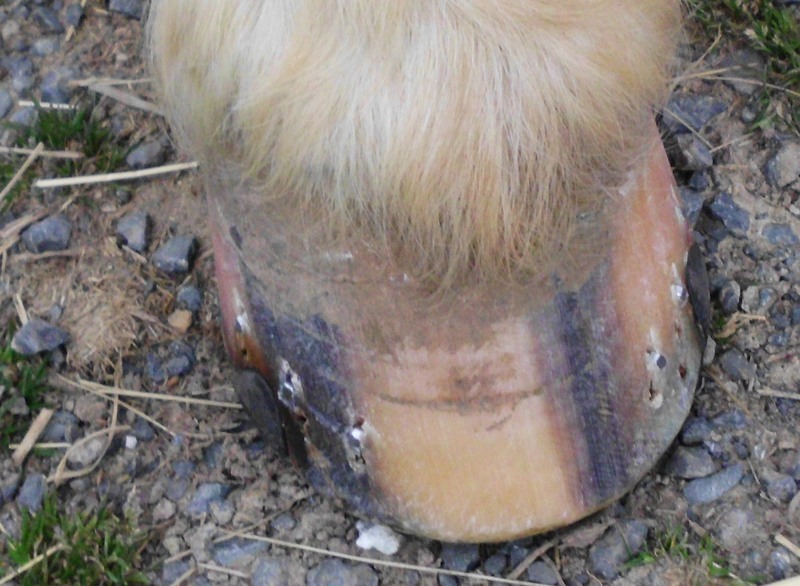 It burns the wall of the hoof and helps shape it to better contour to the shoe. 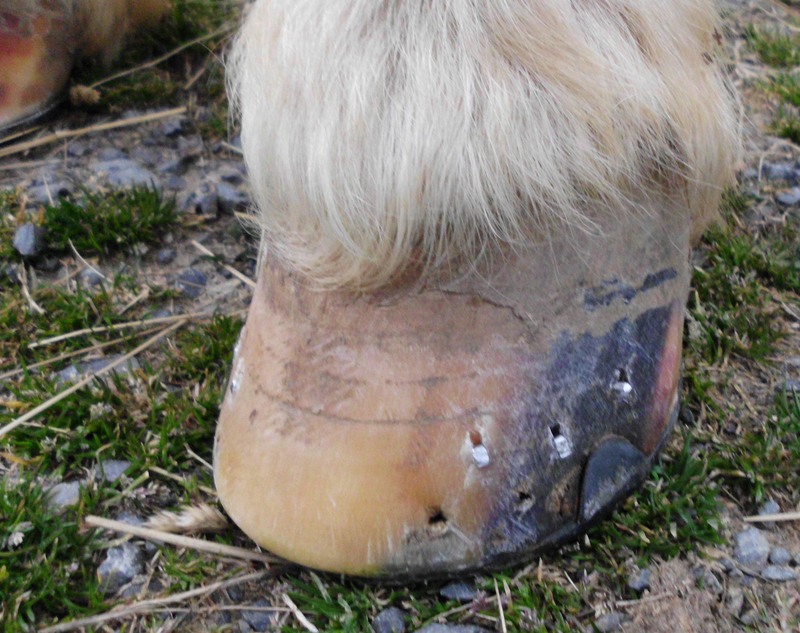 This also helps seal up the hoof to prevent any bacteria from getting inside. To better understand this, picture the hoof made up of millions of little straws. 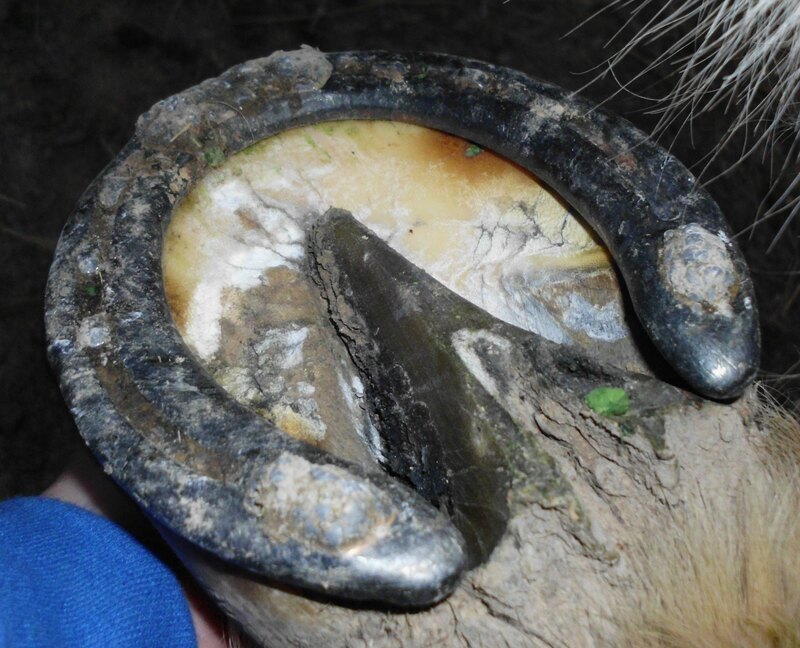 When the hoof is cut, it leaves the ends of all the straws open. By burning the hoof, it closes up those straws. Be assured that the burning does not hurt the horse in any way. They do not even feel it. I wish I were able to get some photos of this process but I was busy holding Simon’s rope so he would stand nicely for the ferrier. Maybe next time.